After reading Srila Prabhupada’s books and seriously practicing the path of devotional service, Niranjana Swami took initiation from him in 1974, in Boston, USA. In 1986, he took sannyasa vows in Mayapur, India, and then proceeded to travel extensively throughout North America, the former Soviet Union, and India, lecturing on the teachings found within the books of His Divine Grace Srila Prabhupada. Devoted to assisting others on this path, Niranjana Swami is also an initiating spiritual master in ISKCON. His home base is Kiev, Ukraine. The management and spiritual leadership experience Niranjana Swami gained during his tenure as president of ISKCON Boston from 1979 to 1983, and his service as regional secretary of New England in 1984, readied him for his GBC appointment in 1987. As a GBC member, Niranjana Swami’s zonal assignments include Moldova, New England, and North American Festival of India. He also serves as co-zonal secretary for Ukraine, Lithuania, Belarus, as well as three regions of Russia: Central Region, Moscow, and Kaliningrad. Currently Niranjana Swami assists the Lines of Authority Committee, which is part of the Strategic Plan for the GBC, by contributing his vision and experience. 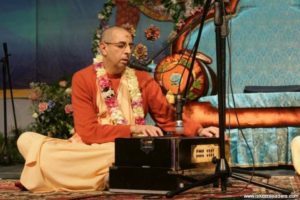 His heartfelt kirtans, insightful classes, and his selfless and caring personality inspire and nurture many ISKCON devotees in their spiritual lives. He consistently trains, supports, and empowers others to manage in a way that makes ISKCON members feel needed and protected, and creates systems of counseling to help spread this ethos further. One of Niranjana Swami’s achievements is the annual Ukrainian Bhakti-sangama festival that he originally conceived and developed over the last ten years. Well organized and lauded for its devotional atmosphere, Bhakti-sangama hosts thousands of devotees from the CIS and all over the world, uniting them around hari-nama, krsna-katha, and vaisnava-seva. Niranjana Swami puts ‘devotee care’ as a top priority. His thoughts on this topic have been recorded in a book Taking Care of Krishna’s Devotees, which has inspired many to find ways of improving dealings in devotee communities. His other publications include compilations of his letters to disciples and counselees, and transcribed lectures and interviews in book format.